Welcome to Radio Ecoshock. In our second half hour, I’ll be talking with author, blogger John Michael Greer. He thinks we can walk back technology to safer options that can live past the crash. But first, we explore the wonders of how the climate really works, why the ozone hole and climate change work at cross purposes, Antarctica, and fires in the Southern Hemisphere. It’s science the way I like it with Dr. Andres Holz. 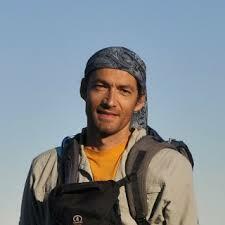 To sort it out, we’ve reached the lead author, Andres Holz from Portland State University. Holz has a PHD in Geography from the University of Colorado, but also a degree in Forestry Engineering from Universidad de Chile, in Santiago. His specialties include wildfires in southern South America as well as Tasmania and New Zealand. We’ll be talking about the new paper titled “Southern Annular Mode drives multicentury wildfire activity in southern South America.” That was published in the Proceedings of the National Academy of Sciences, or PNAS, in August 2017. Andres Holz is the lead author. To understand the research done by Holz, we need to grasp a climate pattern called the Southern Annular Mode or SAM. It is also known as the Antarctic Oscillation. Winds similar to the Jet Stream in the Northern Hemisphere can be drawn tighter around Antarctica, or they can spread out wider. The ozone hole, he tells us, tends to cool the upper atmosphere, which draws those winds tighter to the south pole. My understanding from other guests is that tighter pattern can lead to drought and more forest fires in Australia. It also impacts the southern parts of Chile and Argentina. As you know, the Montreal Protocol of 1987 limited the production of ozone-destroying chemicals like CFC’s. The recovery of the ozone over the southern pole has been irregular: the hole decreases some years, but then expands again. Eventually, the theory goes, it should heal. Global warming, on the other hand, has the opposite effect. As the atmosphere warms, those jet-stream like winds expand further from the southern pole, which has impacts on climate in the southern hemisphere. As we continue to warm the planet, global warming starts to overcome any effect from the ozone hole. So we know the direction this is going. But what makes it all strange: the pressure systems in Antarctica are still a long distance away from South America, separated by ocean. And yet changes at the Pole do affect weather quite far away. There is a similar pattern in the Northern Hemisphere, another oscillation. And the oscillation in the Eastern Pacific called ENSO, known to us as El Nino and La Nina – also changes weather far away in North America, and even in Europe and Africa. How is that possible? Scientists have given those long-distance relationships the name “teleconnection“. We don’t know all the details of how it works (although that’s a subject of study). But we do know that changes in one part of the atmosphere somehow affect places far away, and it’s predictable. When we know that El Nino is developing in the Pacific, we can predict heat and drought in the Western United States, and higher global temperatures generally. Andres Holz describes the changes to South American forests from the Southern Annual Mode. There are a ton of other factors in South America, including human burning of forests for land-clearing, and the relatively new human ability to put fires out. When it’s all said and done, my impression is that there will be more forest fires in Chile and Argentina as the planet warms. If so, then more carbon will be released to the atmosphere, because under new climate conditions, some of those forests will not re-grow, but will become grass lands. So wildfires in a changing climate can become a climate feed-back effect, as more heat makes more fires which lead to more carbon and more heat. In the 2016–17 fire season, more than 500,000 hectares burned in central and southern Chile, due to a long drought, amplified by concurrent positive SAM and ENSO conditions. By the way, this study was done by measuring the burn scars on trees – thousands of them in different parts of southern South America, and dating all the way back to 990 AD. Until the Industrial Revolution and the age of fossil power, humans lived sustainably. There was no other choice. Now this civilization seems headed off a series of cliffs, whether it’s climate change, wiping out nature, or nuclear demise. Is there another choice? Maybe, says author John Michael Greer, we should steer toward the past. Greer is the author of at least 30 books, dealing with alternative lifestyles, thinking, and science fiction. 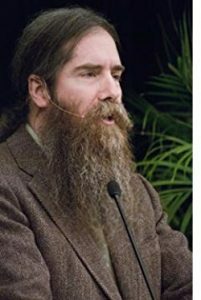 His blog former “The Arch-Druid Report” had a huge following, and a lively discussion area. Greer credits his online community as part-inspiration for his new book “The Retro-Future, Looking into the Past to Reinvent the Future“. At the beginning of this interview, we have to clear the mental roadblock behind the word “progress”. JMG has to disarm several IED’s of common modern thinking, in order to communicate his real solutions. These accepted “truths” are like road-side bombs, because as soon as our brain starts to drive along the road, these massive social mis-perceptions explode to stop our ability to think. The second chapter of “Retro-Future” slashes away at the second great illusion of our times: that humans can control nature, and can control our future. Like you, I’m kind of tired of the green prophets who promise we can just use renewable energy like solar or wind, and never have to give up a thing in our current lifestyles. We’ll all drive around in electric cars and feel good about it. Or maybe everything will be powered by bio-fuels? Not likely, says Greer. His new book is just loaded with powerful phrases, like this one: “a great many people these days seem to have lost the ability to grasp that the other side can learn.” Sure that’s true about foreign policy, but is not just true of humans. Parasites, bacteria and virus have their own way of “learning” to overcome our defenses and exploiting our weaknesses. HIV/AIDS is just one example. What if an “intelligent” nature decides humans were an interesting experiment, but now too dangerous to allow to continue? I disagree with John Michael Greer’s dismissal of science and “people in white lab coats”. Actually, I think the white lab coat crowd has indeed abused us with too many pharmaceuticals and pesticides – BUT they have also brought us life saving medicines. Plus, Radio Ecoshock hears from many brilliant scientists. I don’t think that science is done yet. But I totally agree with Greer’s assessment that civilizations rise and fall, and this one is falling – not suddenly perhaps, but on a bumpy road down. Like me, JMG disagrees with Guy McPherson’s claim that humans will go extinct soon (by 2030 according to McPherson). John Michael says the state of breakdown called “Dark Ages” may be our natural state. In any case, if things are falling apart, Greer suggests seven basic technologies that we could take with us, that we should all learn to preserve so that intelligent and necessary ideas can continue. These include basics like the printing press and intensive organic gardening – which can operate without fossil fuels or electricity, if need be. The book is packed with ideas. But how far back do we have to go in time to find sustainability? 1950? 1750? But Greer says it’s not a matter of trying to reproduce a dead historical time. Rather, we have to choose what new technology we accept, and what old technology should be revived, in order to avoid social break-down and a dead planet. CAN WE CHOOSE OUR TECHNOLOGY, AND TAKE THINGS FROM HISTORY? John Michael Greer says “history is not a straight line, it’s a smorgasbord” of choices. We can pick this and that. I’m wondering is history is more like an inter-dependent ecosystem. Is it possible to remove one piece of technology, without the surrounding system of that time…? For example, apply the bricolage technique to selection of weapons. Who will choose swords, when the technology of guns is still known, much less missiles and nuclear weapons? Will steam make a come-back? Will horses return as our transportation? Still, it’s clear what Greer it talking about. We don’t have to accept every new technology simply because it’s being hyped. Choice of technology is a right, or it should be. People who techno-shame or techno-bully – you know, your TV is so small, your phone is so old – that all needs to end. At a deeper level, when you read the book, John Michael Greer is also looking at the long haul. One of his seven sustainable technologies is intensive organic gardening. Fossil fuels, and all the chemicals and pesticides made from them, will not go on forever. Perhaps the intensive industrial system that made them will perish as well. Humans, if there are humans, will be doing intensive organic gardening partly because there will be no other choice. Realizing that all civilizations are waves in time, which crest and then fall away, maybe we can prepare for the next stage, with intelligent choices for a retro-future. That’s it for Radio Ecoshock this week. I’ve got two top scientists lined up for next week as we explore extreme climate changes and maybe another way out. I’m Alex Smith, your dedicated non-profit broadcaster (help me if you can!). Thank you for listening, and caring about our world. Greer is a climate denier who denigrates scientists. I would advise that he not be interviewed again.